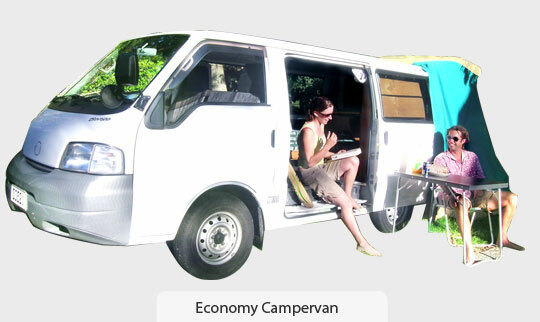 Economy campervans are fully furnished with curtains, carpet on the floor and a weather proof awning for standing room. Furniture includes a day sofa, double bed or two single beds, storage cabinet, table, double gas cooker and grill. During the evening, keep the awning attached for easy access, or sleep with all doors closed and use the mosquito net for fresh air. The mosquito net covers the passenger’s window. Staying in a camping ground with powered site enables connection of the 240 volt power cable. Next plug in the multi plug, hanging light and any electrical devices you may have. 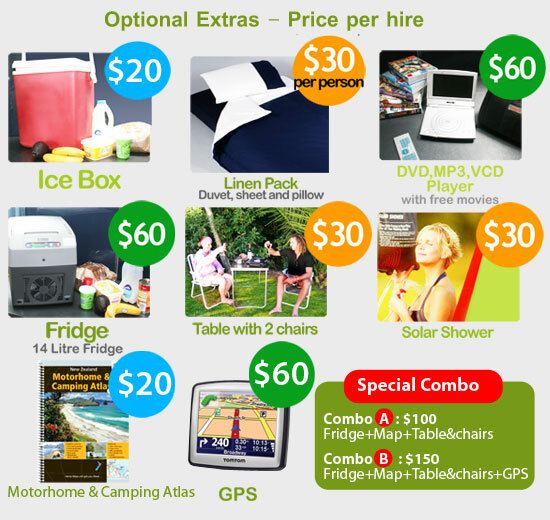 The campervan also includes kitchen utensils and a water container.